From the same deadly crucible that forged Al Qaeda and ISIS, a new terrorist plot threatens to strike at the heart of America, and it'll take an uneasy alliance between New York's sharpest investigative journalist and one of its toughest private eyes to take them down. Badge of Evil is the first novel in a bold new thriller series from the writing team of private investigator Bill Stanton and award-winning journalist Craig Horowitz. All eyes are on New York City's police commissioner Lawrence Brock after his hands-on role in a raid on a potential terrorist cell that turned into a blazing shootout. There's even talk that he may be headed to Washington to take over Homeland Security. Investigative journalist A. J. Ross wants to expose the ruthless opportunist behind Brock's heroic image. Freewheeling private investigator Frank Bishop is hired by the family of the lone surviving suspect, desperate to prove the young man's innocence. A. J. and Bishop hate each other at first sight, but they'll need to learn to work together quickly if they want to take down the commissioner--because Lawrence Brock will do anything to ensure the dark secrets of his past remain hidden. 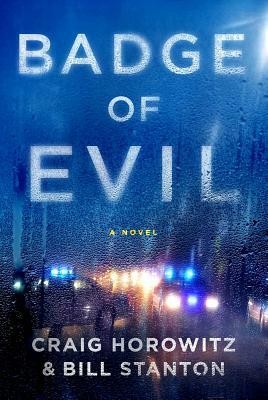 Badge of Evil introduces a dynamic new voice in thriller fiction, in the spirit of such bestselling authors as Harlan Coben and David Baldacci. It is a novel of our times and for our times--an all too familiar story of corruption and abuse at the highest levels, and how the lust for power can drive men to commit the most shocking acts. Craig Horowitz is a former award-winning journalist with New York magazine, where he was one of the city's best-known reporters, covering City Hall, Rudy Giuliani, the NYPD, and 9/11. He has also reported extensively from the Middle East and served as a senior writer at People magazine. A guest lecturer at Columbia's Graduate School of Journalism and NYU's Graduate School of Journalism, as well as a regular commentator on television and radio, his writing has been featured in many anthologies, including The Best American Crime Writing 2005 (HarperCollins). He is currently a partner at Finsbury, a global strategic communications firm. Bill Stanton is a recognized leader in the field of safety and security and a founding partner at QVerity. When his career as a decorated NYPD officer ended when he was injured in the line of duty, he moved into the private sector, where he specializes in executive protection and investigations. He was a safety and security contributor for both The Today Show and Good Morning America, and appears regularly on programs at FOX, CNN, Telemundo and other networks. He is the author of The Anti-Terror Checklist.